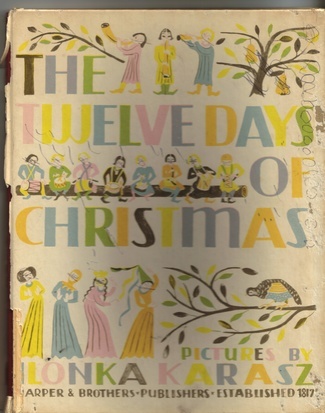 I found this book, The Twelve Days of Christmas (published in 1949) with pictures by Ilonka Karasz at a yard sale a few years ago, for 25cents. 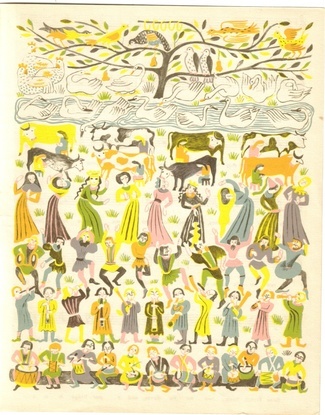 I was very drawn to the illustrations, and the colors in particular, and very happy to spend a quarter on it. I knew nothing about this artist when I bought the book, but now know just a little bit about her career (um, really, how did we survive before Google?). 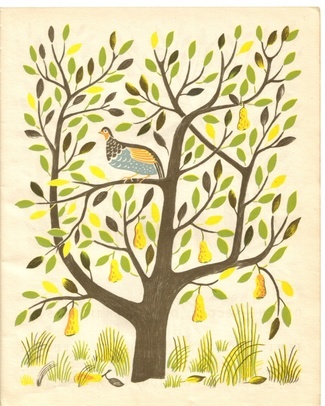 She's most well known for her work with The New Yorker, but she did an amazing variety of other work--furniture design, textile work, and eventually was a leading wallpaper artist. I would love to see some of her wallpaper designs, but even with the beauty of Google, I still can't seem to do so. The book is in rather shoddy condition--but only the binding and cover. 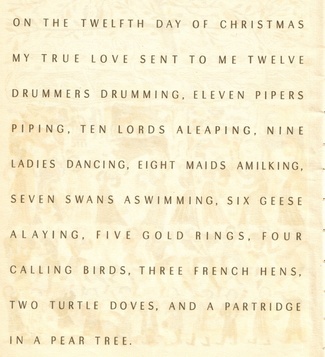 I've thought about having it repaired, or just using the pages as prints--but really--you can't take just one of the twelve days of christmas, now can you?